DiscoverNiagara.com is the official site for all the best things in Niagara Falls and the Niagara Region. Look out for entertainment tickets, hotel offers, and attraction deals. As this site progresses please look out for more information to be added. We’re going on a tour of Niagara, so let’s get started. Would you like to take in some entertainment while you’re in our area? Niagara Falls has something for everyone. Magicians for the family, rock ‘n’ roll, comedy, variety, dinner shows, and world class performers that play at different times throughout the year. We also have some wonderful museums and attractions. You can take your family to play miniature golf, ride a giant wheel, enjoy go-carts, water parks, and history museums. You can even see the Falls up close riding the world famous Maid of the Mist boat ride. And if you need a place to sleep overnight, Niagara has many elegant hotels, bed and breakfasts, motels, and camping facilities to choose from. You can relax at one of the many accommodations, steps to the beautiful Niagara Falls brink, and get a price that will suit your budget. One of the little known highlights of Niagara is our shopping. There are many unique areas that have all the Niagara-flavor shops, and of course we have outlets for those that are always looking for bargains. Our historic Niagara-on-the-Lake shopping area is delightful, and we have even expanded our major Outlet Mall, Canada One Factory Outlets, on Lundy’s Lane in Niagara Falls. There are many specialty shops hidden around the region where you’ll find an unexpected treasure, so keep your eyes open for that one unique item you want to take home. We cannot forget to mention our golfing. Many are unaware of the high quality golf courses that are here in Niagara. There are golf pros to help perfect your swing, par-3 courses to 18-hole championship courses, and some of the best pro shops in southern Ontario. Lake Ontario, Lake Erie and the Niagara river are breath-taking and the fishing is great for the entire family. We have bass, trout, catfish, walleye, and places to rent a fishing boat, ski boat and canoe…on which you can enjoy watching the sunset at the end of the day. Niagara also has many delicious culinary offerings! Everything from: family restaurants, steaks, fish, buffet, fast food, slow food, food with music, outside restaurants, waterfront restaurants and 5 star restaurants with fine linens, award winning local wines and beautifully arranged food. It’s a lot of fun to eat in Niagara, even if you just want coffee or an ice cream cone for the kids. When you think the night is over and you’d still like to do just one more thing… we have a nightlife that will please all. You can sit quietly while overlooking the water, or go dancing and see the celebrities, a comedy club, or a local pub. 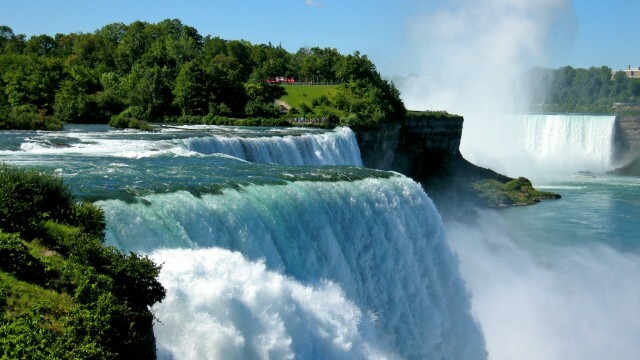 Niagara is a family destination with something for everyone. There are few places that can beat the hospitality and friendliness that is shown throughout the beautiful Niagara Region.